Liam Neeson is set to join Chris Hemsworth and Tessa Thompson in Sony Pictures’ “Men in Black” spinoff, an individual with knowledge of the project tells TheWrap. Neeson will play the head of the MiB’s U.K. office. F. Gary Gray is directing from a script by “Iron Man” writers Matt Holloway and Art Marcum. The film is slated for release on June 14, 2019. The spinoff will not see Tommy Lee Jones and Will Smith return to play Agents J and K. Instead, the ensemble piece focuses on the secretive New York agency that defends Earth from hostile aliens and helps friendly ones blend into human society. The spinoff is being compared to “Jurassic World,” in that it will take the series in a newer, broader direction while giving a nod to the previous films and characters in the series. “Men in Black” was a huge hit in the ’90s, cementing Smith’s status as one of Hollywood’s most bankable actors following “Independence Day” and “Bad Boys.” Combined, the three “MiB” films have grossed over $1.7 billion worldwide. Walter F. Parkes and Laurie MacDonald are producing, with Steven Spielberg as executive producer. 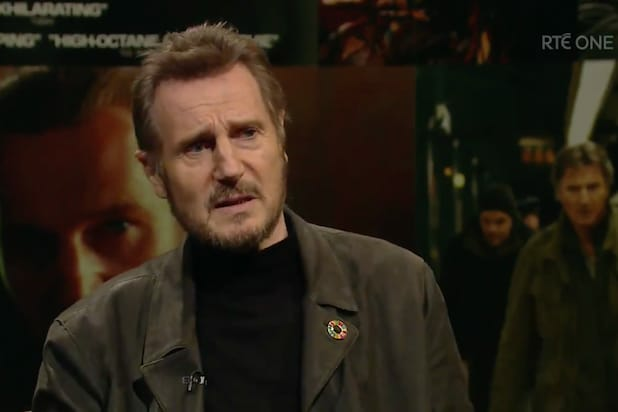 Neeson is repped by CAA and Artists Rights Group.